I want to run a small 12V -16V AC motor via DCC and am not sure if you have a decoder for this and if so how to connect up. Some Digitrax decoders, such as the DG583S, can be programmed to operate AC motors. When you program CV61 to a value of 004, Digitrax decoders with split field motor drive capabilities will convert their motor leads to drive a "split field" AC motor instead of the default DC motor. This lets you run Maerklin 3-pole AC motors and similar motors in a number of locos built in Europe with Digitrax 1.5 amp decoders. For Hi-rail AC motors, you can use Digitrax decoders rated at 3 amps or more. 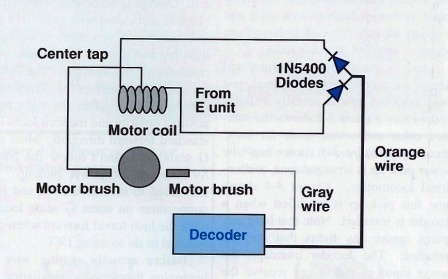 To use an AC motor in this way, connect the common motor/brush to the blue (lamp common) lead on the decoder. Connect the forward field coil to the decoder's gray lead. Connect the reverse field coil to the decoder's orange lead. Be sure that any other mechanical or electrical reversing relay and/or track feeds are removed from the AC motor. 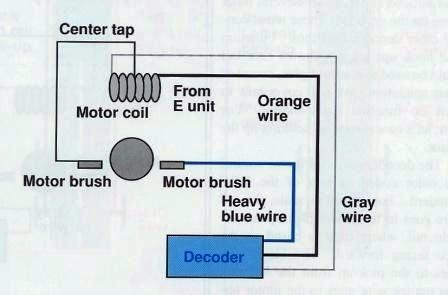 The decoder's wires should be the only wires connected to the converted AC motor. Be sure all motor connections are isolated from the motor chassis. 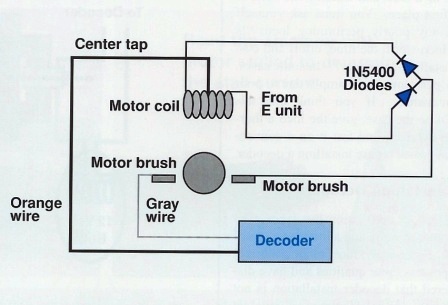 Once you set up your decoder to run with an AC motor by programming CV61, you must have the motor or a lamp load connected from the blue lamp common wire to one of the motor leads to do any additional programming. You can also connect a 1 k ohm resistor to the blue and gray wires to simulate the AC load to allow additional programming. At least one model railroad manufacturer offers a fixed speed motor for use with operating accessories. Motors such as Faller 628 and 629 are synchronous motors which rely upon both the AC voltage and the cycles of Alternating Current to operate properly. These motors operate at a fixed speed and simply use "straight" AC for their operation. The three connections on the right are for the solenoid coils; the connections on the left, top & bottom, are for the electrical contact points. There are other examples such as Brawa 2760 and Circuitron 5604, but these have many more contacts than the two needed to turn a motor on/off. Likewise, you could cobble up something with a Peco turnout motor such as no. 3010 combined with their accessory switch no. 3013.